Before proceeding users should be familiar with Image Paths as used in Version 3 and earlier. To this end it is highly recommended the user consult the following knowledge base article. Furthermore the following article on template paths in Version 4 is also useful in understanding the concept of using placeholders and wildcards in path statements. Version 4 allows the user to work with tnj files in the same manner as previous versions of the software. These three options continue to be available in Version 4 whenever working with an open tnj file or whenever tnj files are imported or merged into an SQL job. Once the tnj file is in the database as an SQL job the above paths are no longer used. Once the tnj file has been merged or imported into an SQL job the image paths used are those set in tsAdministrator as described below. When working with SQL jobs the image paths used are in the following order. 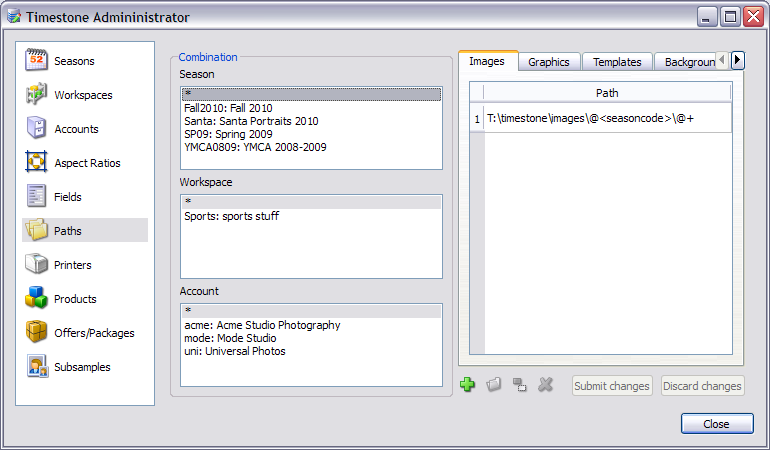 A feature of setting paths in tsAdministrator is the ability to set paths for each season, workspace or account as needed. As seen in the aforementioned document this can be achieved by entering direct paths for each season, account or workspace or by the judicious use of placeholders. 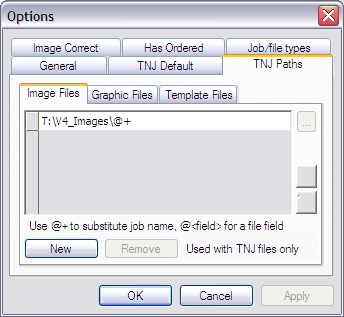 Despite the absence of loose tnj files, Version 4 SQL jobs continue to support the jobname#images folder. Select the Paths object then All (*) for the Season, Workspace and Account. When the job GreenvilleSP09 is open the program will use images in the GreenvilleSP09#images subfolder. Likewise for the YMCA08 and Fusel080712 jobs. When the job GreenvilleSP09 is open the program will use images in the GreenvilleSP09 subfolder. Likewise for the YMCA08 and Fusel080712 jobs. Create a parent directory for each season. Use either the season's code or description as the folder name. The two examples below make use of the season code. It is possible to enter multiple image paths. The software will then search for images in each path in turn. 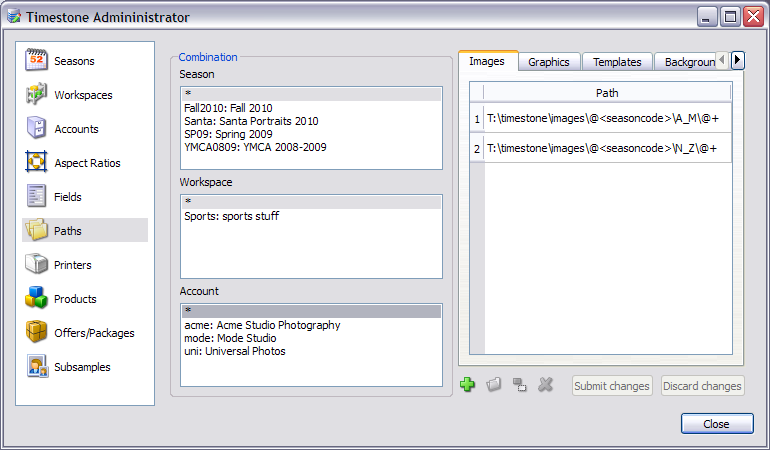 Create a parent directory for each season. Use either the season's code or description as the folder name. Within each season's folder create a folder for A-M jobs and another for N-Z jobs. The examples below make use of the season code. The GreenvilleSP09 job is in the SP09 season and the job name begins with G. When the job GreenvilleSP09 is open the program will use images in the T: imestone\images\SP09\A_M\GreenvilleSP09 folder.